This picture came across Facebook, which is where I have been getting most of my US news that for some reason does not seem headline worthy internationally… like the whole Chick-Fil-A thing. Of which, honestly, I know little, and did not want to go researching too deeply. For all i know, this was photoshopped. Or, it could be the opinion of a local franchise manager and not corporate HQ. 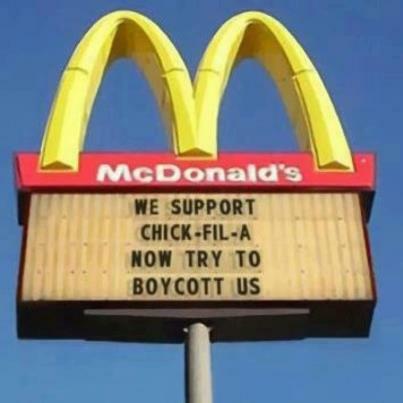 So, is McDonalds saying they agree politically with Chick-fil-A? Or simply asserting their support for a corporation to act according to the principles and values of its ownership? Personally, I have never been to a Chick-Fil-A, they just do not exist in my part of the country, and I have rarely been to a McDonalds in the last decade. 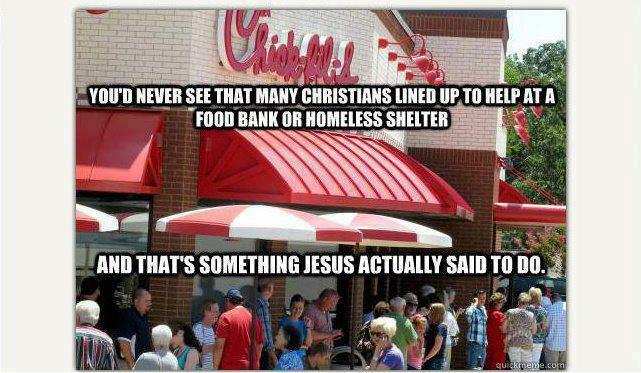 Not knowing much about the original controversy, I could not say whether I agree with Chick-Fil-A or its critics, both, or neither. I can say that I support both companies in this: they are not the government, and therefore they have the right to be religious or not religious, to run their company according to Christian, Muslim, Jewish, or secular humanist principles as they see fit. There is no law that says a privately held or publicly traded company must maintain a wall of separation between church and boardroom – or rather that even if there is a distinction between the two, it is not the case that the one has no business influencing the other’s business. I would especially applaud McDonalds if they disagreed with Chick-Fil-A politically, but supported them anyway, with their right to run their business according to principles. Then they would be in the place of Voltaire, ironically reminding us all of the need for a little civility in civil discourse and political disagreement! 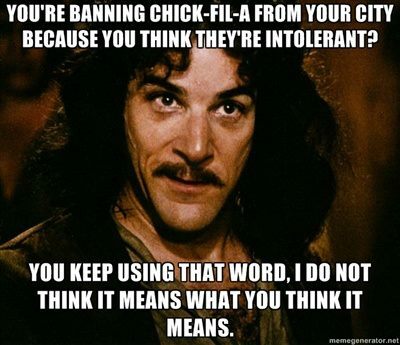 Also a reminder that religious freedom is not eclipsed at the doorway to the church, synagogue, or mosque; it extends to the public sphere, and even into the corporate offices of fast food restaurants. By A.J. Boyd in Church and World on August 1, 2012 .